Breathe new life into your old midi collection! Magic Midi to MP3 Converter will help you you’re your MIDI files into one of the many popular formats including MP3, AC3, WAV, OGG, or even the lossless FLAC. Supporting all types of MIDI files, the tool can convert RMI, KAR and MIDI files to a variety of waveform audio formats with just a couple of mouse clicks. The built-in tag editor allows specifying text for artist, song and album information. Make your music sound different! Magic Midi to MP3 Converter support selectable sound fonts, allowing you specify your own wavetables for various instruments in the industry-standard SoundFont format. In addition, you can add adjustable reverb and echo effects to produce the best sounding audio. The built-in media player allows instantly applying audio effects while play back the result immediately, allowing you to preview the resulting audio without saving, opening and playing files in an external player. Old phones used polyphonic MIDI files as the only ringtone format. Today, the MIDI format is getting abandoned, with many phones no longer supporting MIDI ringtones while switching exclusively to MP3 format. Magic Midi to MP3 Converter will help you convert your old MIDI ringtones into MP3 ringtones. Magic Midi to MP3 Converter is an easy solution to help you use your old MIDI songs and ringtones in new mobile phones and communicators. Your old MIDIs never sounded that good! Instead of using the simplistic and unconvincing FM synthesizer used in older phones and inexpensive sound cards, Magic Midi to MP3 Converter has access to all the computational resources of modern PCs to employ sophisticated sample-based synthesis using pre-recorded sounds of real music instruments to play MIDI files, making your MIDI ringtones sound just like a real recording. Thanks to the SoundFont support, Magic Midi to MP3 Converter can produce MP3 files that sound completely differently with different wave samples used. Magic Midi to MP3 Converter allows specifying custom conversion parameters to control the quality and size of the output. Whether you just want a bunch of small-size MP3s to upload as your phone’s ringtones or want the highest-quality classic music to be stored in the lossless format, Magic Midi to MP3 Converter has options for you. 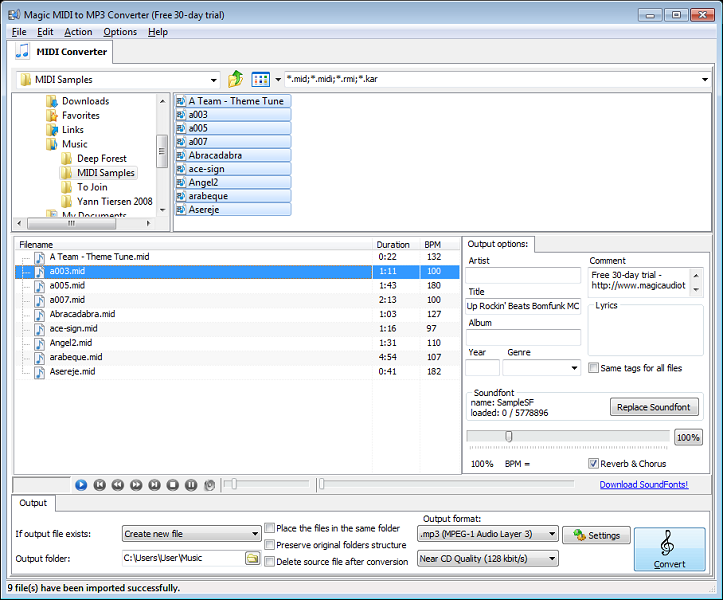 Magic Midi to MP3 Converter supports fully automated batch conversion mode, allowing you to convert a bunch of MIDIs into a format of your choice in just a few clicks. How to uninstall MIDI to MP3 Converter? How do I uninstall Magic MIDI to MP3 Converter in Windows Vista/Windows 7/Windows 8/Windows 8.1/Windows 10? Select “Magic MIDI to MP3 Converter” and right click, then select Uninstall/Change. How do I uninstall MIDI to MP3 Converter in Windows XP? How do I uninstall Magic MIDI to MP3 Converter in Windows 2000? How do I access the Magic MIDI to MP3 Converter download for PC? It’s easy! Just click the MIDI to MP3 Converter download button at the page. Clicking this link will start the installer to download MIDI to MP3 Converter free for Windows. Will this Magic MIDI to MP3 Converter download work on Windows? Yes! The MIDI to MP3 Converter download for PC works on most current Windows operating systems.